Did you know that nearly one child in every five in New London County is food insecure? And that the overall food insecurity rate in the county is more than 12%? Food insecurity means that a person doesn’t know when, or if, their next meal will come. While food donations increase during the holiday season, they typically drop in subsequent months. 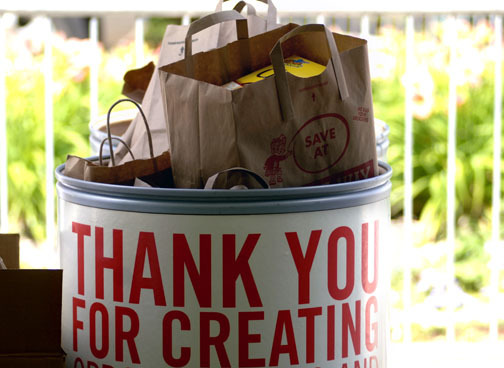 Your business, school, organization, or civic group can help by running a food drive. Every donation matters, and your participation means that more of our neighbors struggling with hunger and food insecurity might have a meal on the table for their family. Since 1988, the Gemma E. Moran United Way/Labor Food Center, a program of United Way of Southeastern Connecticut, has played a key role in providing one of the building blocks to a good quality of life by feeding food insecure individuals and families all across our community. The Food Center provides food and household items to 85 free emergency food assistance programs throughout New London County including shelters, food pantries, after-school programs, day care centers, community meal sites, and programs for seniors. Last year, the Food Center helped to feed nearly 22,500 people each month through its member food and Mobile Food Pantry program. Through its network of member agencies and Mobile Pantry distributions, the equivalent of more than 2.5 million meals and snacks was provided, at no cost to those in need. Running a food drive is easy! Visit United Way’s website to find tips and tools for your drive, including posters, Food Center facts, and other promotional ideas. It’s suggested that you narrow your request for 4-5 items, making is easy for people to give. Currently needed items at the Food Center include: pasta and sauce, cereal, baby food, granola bars, and crackers. Donations of foods that are whole grain rich and low in sodium are encouraged. In addition, it is requested that donations not be in glass containers or items that have expired. Monetary donations are also welcome. Thanks to the Food Center’s partnership with Connecticut Food Bank and Feeding America, a donation of just $1 can be leveraged towards the purchase of four meals. For more information about how to run a food drive, visit www.uwsect.org/how-run-food-drive. Donations to the Food Center can be made online at www.uwsect.org/give, and be sure to select the Food Center from the drop-down menu. © 2019 United Way of Southeastern Connecticut. All Rights Reserved.